I had heard her “reading” behind me, but wasn’t focusing on what she was saying. I was trying to enjoy our Flashlight Friday with some reading as well. But that line – that line pulled me out of my book. She continued to pace behind me, “reading” from her book. I knew she wasn’t reading the words in the book. Making up her own story is still her favorite reading time activity, even though she can read books that are “just right” for her. Some days, like today, the day before Spring Break, it’s a battle we can’t fight. We know we won’t win. After several minutes of listening, it was clear she was “reading” about Jane Goodall. It was taking every ounce of will power not to laugh. “I read chimpanzee books until I was six. Those were long years…” she reads as if she is exhausted. That was it. I couldn’t contain my amusement, but tried to stay as silent as possible. However, at this point others around us were hearing this, too. “What is she reading?” a boy at the next table asks. “Don’t worry. Read your book,” I reply as I pretended to read mine. She continues on and he can’t let it go. “What is she reading?” he asks again. “About Jane Goodall and chimpanzees,” I tell him. This is the same student that stars in my slices Finding a Just Right Book the Week Before Spring Break and What’s a Pole Vault?. She is a fountain of slices! She has been my muse this month! “Was that you or her?” I asked my son from the front seat. “Her,” he said with a chuckle. He’s constantly impressed and amused with his baby sister’s flatulence. I want to shake my head at the things teenage boys find entertaining. But since drafting this slice, I’ve realized that I am writing this story…so what does that say about me…. 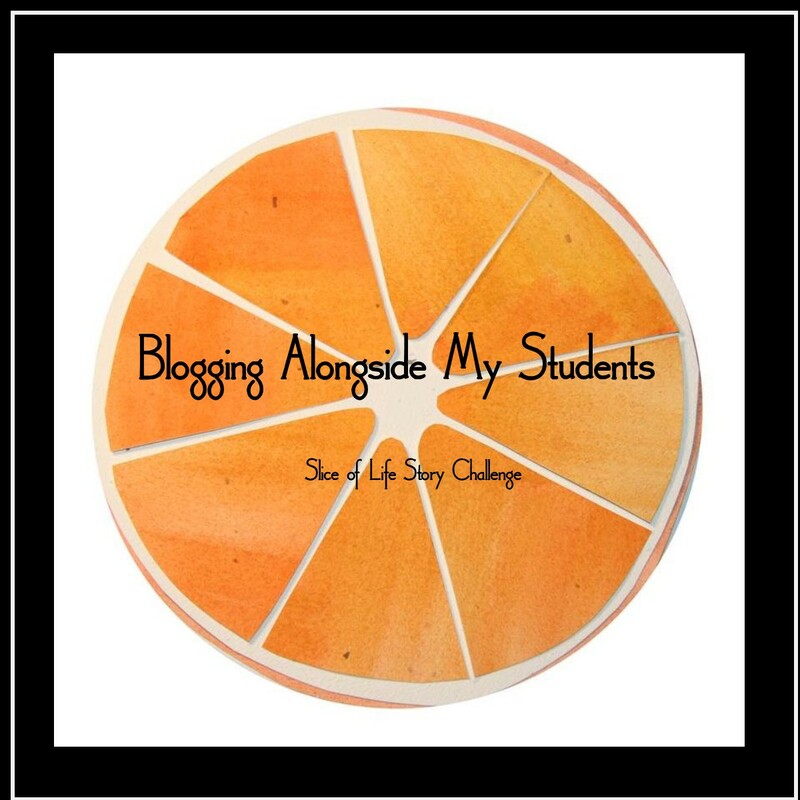 Posted on March 29, 2019 Categories Life with a Teenager, Slice of LIfeTags slice of life4 Comments on Have You Ever? “I need to show you something,” she said as she walked in holding her laptop. “I have to sign in again.” I waited as she set the laptop on the tiny couch and typed in her password. The horrible possibilities rushing through my mind. When I noticed what was open on her screen, I realized why she had walked over here. She was showing me that my slice was featured on TWT today! I knew this, but she didn’t know that. I was so excited that one of my slices was chosen to be featured in the “Be Inspired” section of today’s post. However, it means even more that a colleague of ten years was so excited for me. In the moment, I was jumping to worst case scenarios, because that’s what I always do. Looking back, now that my nerves have settled, I realize that she was smiling and excited for me. That’s what I missed in my original version of the slice – the happiness and excitement. My anxiety took over and altered the reality, so I’m taking that moment back. Luckily, it’s March and I can reflect and revise my memory of this slice of my day. “I need to show you something,” she said as she walked in smiling and holding her laptop. “I have to sign in again.” I waited as she set the laptop on the tiny couch and typed in her password. When I noticed what was open on her screen, I realized why she had walked over here. She was showing me that my slice was featured on TWT today! I knew this, but she didn’t know that. I was so excited that one of my slices was chosen to be featured in the “Be Inspired” section of today’s post. Thanks for being excited for me, Katie! “How about this book?” she says more to herself than me. She doesn’t really care what I think. “That book is in Spanish,” I tell her, for some reason thinking it will be enough for her to put it back and pick a new one. Some of the students know how to speak Spanish, a few more how to read it. She is not in either of those categories. She continued looking at it, getting ready to put it in her book bag. “You don’t know how to read Spanish. Put the book back and pick a new one,” I repeat. “Did I tell you about the papaya?” my son asked on the way home Sunday night. He took a bite of his granola bar and chewed. He nodded as he chewed another bite of the granola bar. “The Papaya,” he said and then paused.